Aruba is the culinary melting pot of the Caribbean. Nearly 100 nationalities live together on One happy island, and you can taste it! 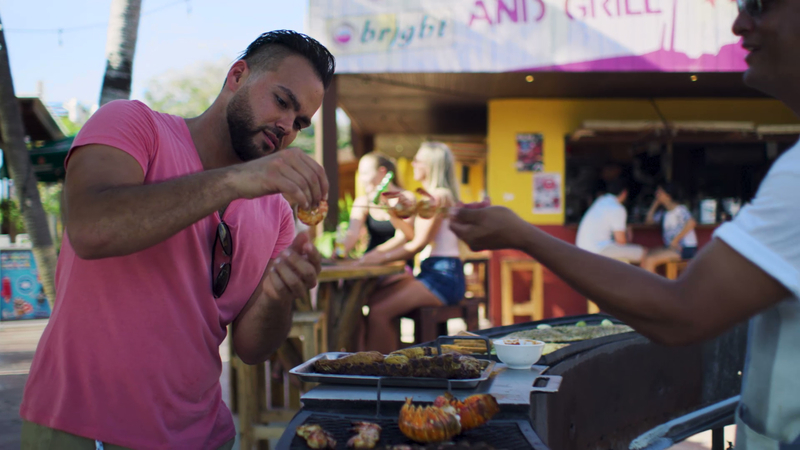 Let Aruba local, and full-on foodie, Samil, show you some of his favorite spots to fill your belly in paradise. Discover one of Aruba’s local cafés, at the amazing Casibari rock formation. Discover one of Aruba’s special culinary events, the Aruba Food Truck Festival. Discover one of Aruba’s local favorites, the super-tasty little Pastechi. My culinary day in paradise starts with a local breakfast favorite, the Pastechi, a light fried pastry filled with cheese, meat, or just about anything. When I’m out exploring, there are so many great places to get a fresh smoothie … we call them “batidos.” For lunch, some tasty BBQ with an amazing view at Casibari Café, where I can walk the mysterious Casibari Rocks. End the day with dinner under the stars, with fresh local fish at any of Aruba’s amazing international restaurants. Watch videos and get insider tips from Sarah-Quita. Watch videos and get insider tips from Shanti. Watch videos and get insider tips from Lilian. Watch videos and get insider tips from Vanessa. Watch videos and get insider tips from the Gomez’.